We stock many blades for faceting saws, trim saws, 10" and 14" slab saws, but we can supply you with blades up to 36 inches in diameter. Contact Us to inquire or order. Super Slicer blades are a great replacement for Pro-Slicer blades. They are thin-core fast-cutting blades. The 4" and 6" sizes can be used with water coolant on most stones. For slabbing, trimming agates and jaspers, or other heavy cutting jobs, you should use an oil-based coolant. Oil provides better cooling properties, which will give you longer blade life. The optimum RPM for 4" Super thin blades is 4000 RPM and 6" blades is 2650 RPM. 5/8" to 1/2" bushing provided for every blade. 10% off on all Economy Blades! SILVER blades have a notched construction on a thin core for cutting more precious material. Similar to Blue Blazer. BLACK blades are sintered and have more diamond for the tougher work needed in cutting dense material like agate. Similar to Black Blazer. RED blades are sintered continuous-rim blades with a heavy concentration of fine diamond on a thin core. Similar to Yellow Blazer, but better price. 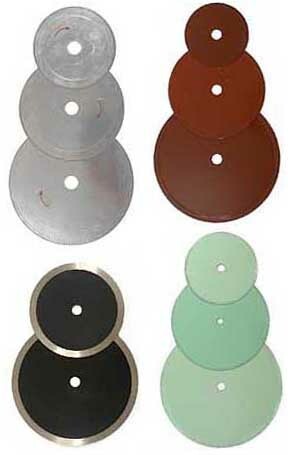 GREEN blades are notched-rim blades for general lapidary such as slabbing. Similar to Green Blazer. We suggest using an oil-based coolant such as Lapidary Oil to extend the life of your blades. Heavy cutting jobs require the use of an oil-based coolant. We stock all Economy blades up to the 18" Green blade! ** These blade have to be special ordered. Expect a minimum of 10 days for delivery. Extra thin plated blades for trimming soft and expensive materials. Description Arbor Hole Our Regular Price SALE Price!! 5" Diameter .006" Thick (.009 kerf) 5/8" with 1/2" bushing $5.50 $2.95!!! While supplies last. Extra thick sintered blades for hard materials. Medium thin sintered blades for general cutting. 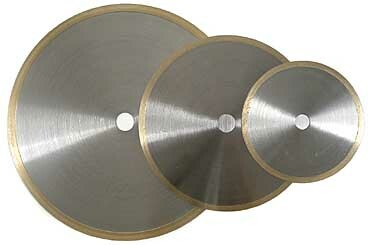 Medium thick notched-rim blades for slabbing and general cutting. ** These blades have to be special ordered. Expect a minimum of 10 days for delivery. These blades have diamond throughout the edge and cut aggressively. What makes them stand apart from other sintered blades is the diamond is oriented in the blade for the most aggressive cutting action. Smart Cut blades also last a long time, because the diamond isn't just plated on top of the rim. Instead, diamond particles are incorporated into the actual metal of the rim. Smart Cut blades up to 10" in diameter work fine with water. When using water, an additive such as Lube Cool 4800 is helpful. If you use oil, these long-lasting blades will last even longer! We only stock the Smart Cut blades listed below. 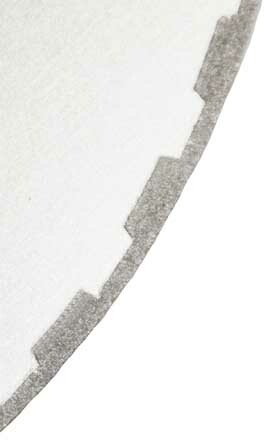 All the Smart Cut blades we carry have a continuous rim.